An open stage set with all of the necessary instruments, drums, guitars, horns and microphones surrounded the well-recognized black grand Steinway Piano in the center of the stage. 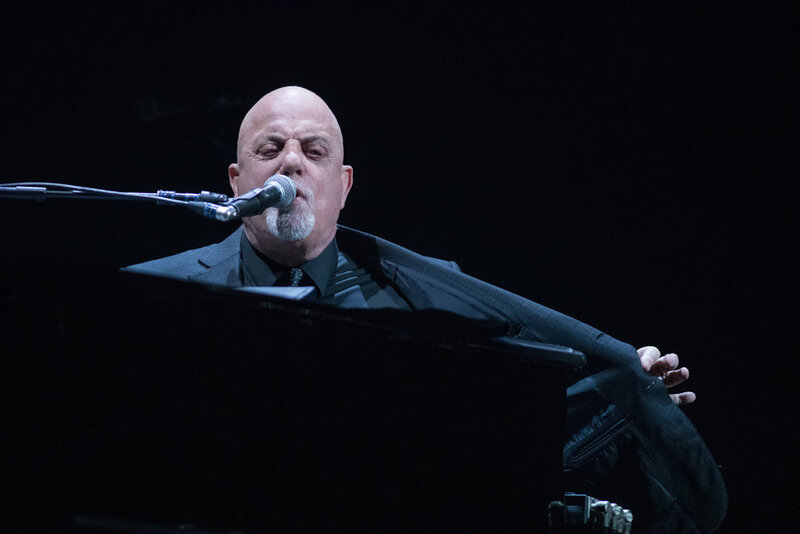 This obstruction free set up allowed everyone attending the Amway Center in Orlando on January 11th the opportunity to see Billy Joel in concert performing his various hits spanning over 40 years as only he can, truly captivating. 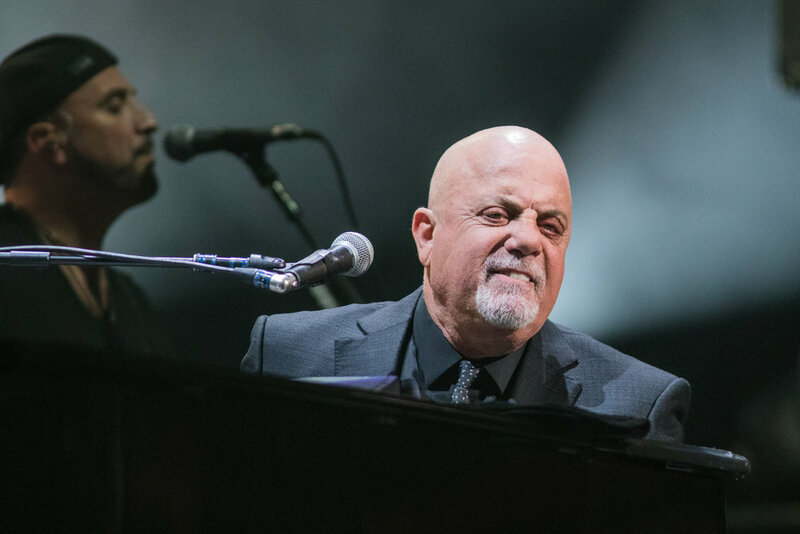 The house lights went down with classical music playing and when the stage lights came up, Billy Joel and his band were onstage and the entire arena audience were on their feet cheering. “Big Shot” was the opening song and applause of approval broke out. Joel was wearing his signature black suite, with black tie and shirt. His fingers glided over the piano effortlessly and he sounded as if he had just recorded this hit song from his album 52nd Street in 1978. Then he and his band of multi-talented musicians Dave Rosenthal (keyboards, piano, organ, Musical Director), Crystal Taliefero (percussion, saxophone, harmonica, vocals), Mark Rivera (saxophone, flute, harmonica, percussion, vocals), Carl Fischer (trumpet, trombone, saxophone), Mike DelGuidice (vocals, guitar), Tommy Byrnes (guitar, vocals), Chuck Burgi (drums) and Andy Cichon (bass, vocals); rolled into “Miami 2017 (Seen the Lights Go Out on Broadway) from Turnstiles in 1976. His piano rotated so he faced the right side of the arena, which at that moment seemed smaller and more intimate. As people danced and sang, Joel tailored the lyrics singing “we all lived here in Florida.” The audience cheered, but quieted down when he ended the song to address them “Thank you very much,” he said facing the front of the stage. “Good evening to you Orlando. Welcome!” He continued to play the piano softly as he spoke “I’ve got my kids with me on this trip. We are going to Disney World.” Everyone cheered on that note and he started playing “When You Wish upon a Star.” When he reached the end of that first verse, he immediately brought the audience back to his 1976 album Turnstiles, which was actually released only five years after Walt Disney World opened. “Summer, Highland Falls” (also from Turnstiles) rang through the room as his piano turned again back to face the left side audience. “This year I’ll turn 70,” he informed the audience just prior to his fourth song of the set from his 1974 LP Street Life Serenade. “That means right now I’m 69. I used to like that number.” People laughed. As they played “The Entertainer” the piano turned to face the audience. “I wrote this when I was in my twenties,” he explained of his next hit “All for Leyna” from his 1980’s album Glass Houses. “I had a much higher voice then. It was easy for me to sing high notes. I’ll try again. ”The audience laughed and cheered. Ending this song he said in a high voice “Thank you.” Then he continued to introduce his next song “I was kind of into a jazz thing” he revealed of his 1978 hit “Zanzibar” which they played featuring Fischer on trumpet (who naturally enriched the song). The piano turned again to face the left audience. When the notes from “Vienna” (from the 1977 The Stranger album) filled the room, everyone stood to sing as they watched the piano turn again. “Layla” from Derek and the Dominos cover was played next flowing into “Movin’ Out,” also from The Stranger album in 1977. All three horn players, Rivera, Taliefero and Fischer took to the front of the stage. Fischer in a black suite with a pink dress shirt, Rivera in a multi-colored dress shirt and black vest and Taliefero dressed in black with a flowing black jacket. They mirrored the rest of the band, all in casual dress to accentuate their professional, fun loving stage appearance. Toward the end of this song as Burgi utilized his outstanding talent to play the drums so Joel could goof around a little, simulating a bit of a strip tease dance, which appealed to this Orlando crowd. 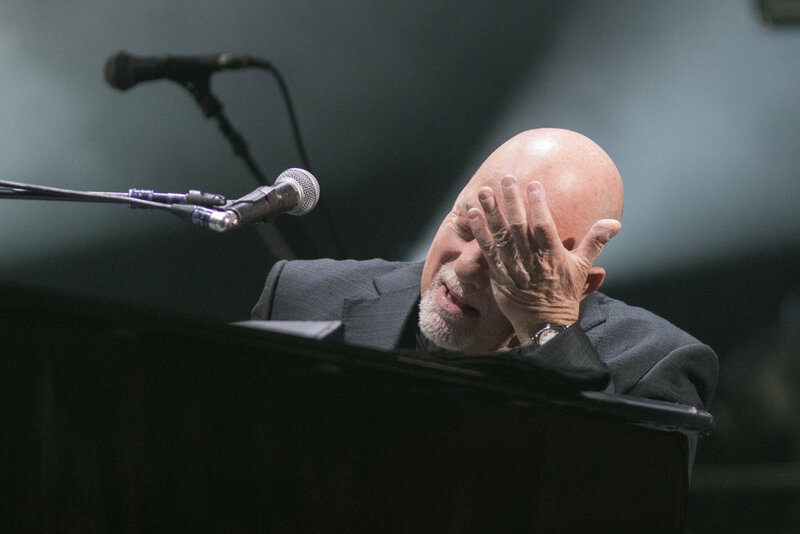 Joel’s fingers truly floated over the keys, especially when he started playing “New York State of Mind” From the 1976 Turnstiles LP. His voice continued to be phenomenal. The screen above the stage showed scenes from Manhattan at night and the ambiance was truly in the Amway arena. Rivera’s amazing saxophone really enhanced this mood, maybe since he is from Brooklyn. When the song ended, Joel turned to the front of the stage and said, “Yeah, I’m in a New York State of mind, here in Florida.” People roared with cheers. He continued. “I’m sentimental, but I’m not stupid.” Everyone laughed. 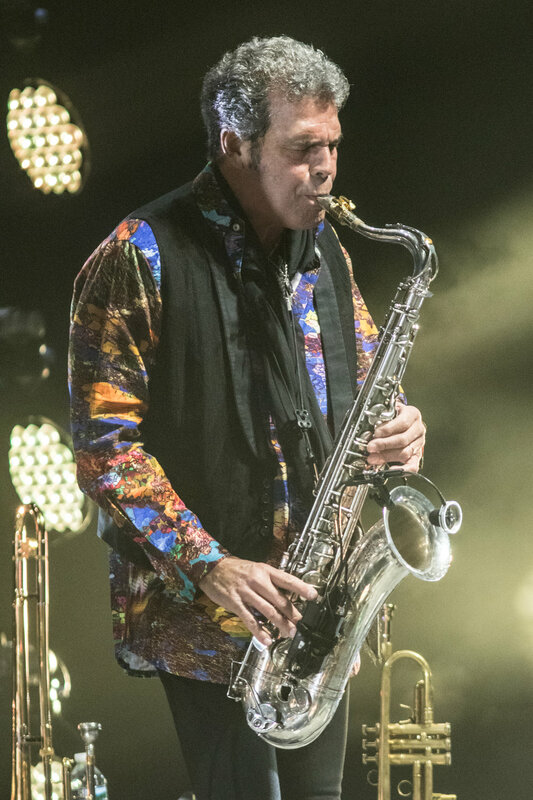 By this time the Amway arena had turned into a family re-union type of a feel as the band started to play “Don’t Ask Me Why” from Glass Houses in 1980, with Joel sporting a pair of sunglasses as he played with enthusiasm. Here is where Cichon, hailing from Australia was spot lighted on bass, excellently adding that bit of funk the audience craved from this song. Next was “And So it Goes” from 1989 Storm Front LP. The arena was dark, allowing a few phone lights to set the mood which was still strong with energy and positive emotions. The second the chords to “Allen Town” hit the keys, the stage lights were bright and the audience’s enthusiasm soared. This single from The Nylon Curtain 1982 LP is one of Joel’s 33 Top Ten Hits. Joel has sold more than 150 million records and has also received six Grammy Awards. 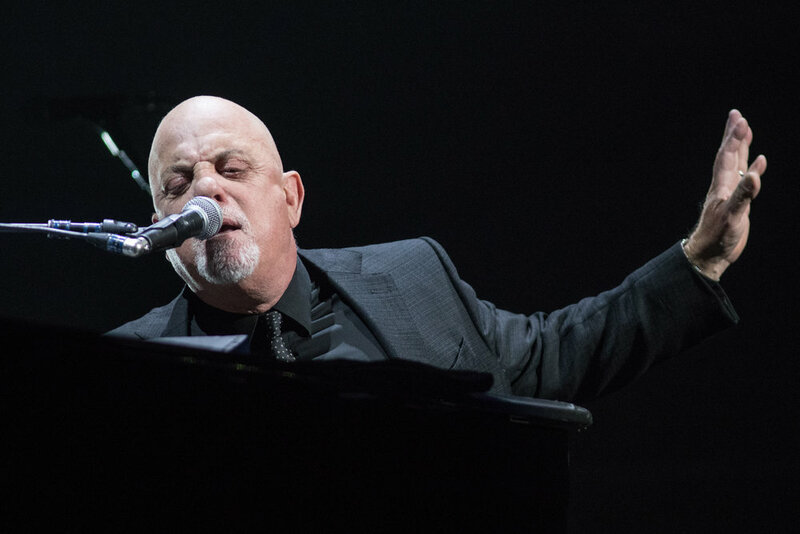 He continued to play the piano, chatting and laughing with the audience, then started playing “She’s Always A women” from The Stranger Album in 1977. This brought the audience to their feet again and almost every women in the house sang as if it was their solo to shine. Some men too! The camera spot lighted various ladies throughout the house setting a tone of appreciation for women everywhere, Joel faced the back of the stage where the crowd was lit up, cheered and clapped while he and the band waved back to those who waved to them. The piano spun again to face left and the notes to “My Life” (Also from 52nd Street) flowed through the air. The piano turned to the right and “Only the Good Die Young” also from The Stranger LP filled the room. People immediately jumped up to dance and sing along with the band who chatted with fans in the crowd. As they laughed and talked, it was apparent everyone truly was having a great time. Joel again thanked the crowd before jumping right into “The River of Dreams” from the 1993 River of Dreams album. DelGuidice sang with Joel on this one and the screen above the stage showed keyboards. People waved their hands as they swayed back and forth. Taliefero left her percussion set and took the spotlight front stage on saxophone displaying her extremely talented abilities. Next, the room stood still when DelGuidice took the front stage right mic and beautifully sang with incredible vibrato “Nessun dorma, the Giacomo Puccini cover. Following this mesmerizing performance was “Scenes From an Italian Restaurant” again from The Stranger LP, which brought the crowd back into singing mode. The screen above the stage showed drawings from an Italian restaurant and transformed the room into that dining, relaxed mood. The piano turned to the right as the beat picked up and fans waved their arms in rhythm to the music. The horn section turned to the back of the room and waved their arms as well, creating a sea of waves. We then were taken back to 1973 when Joel’s keys started playing “Piano Man” from the same-titled LP. 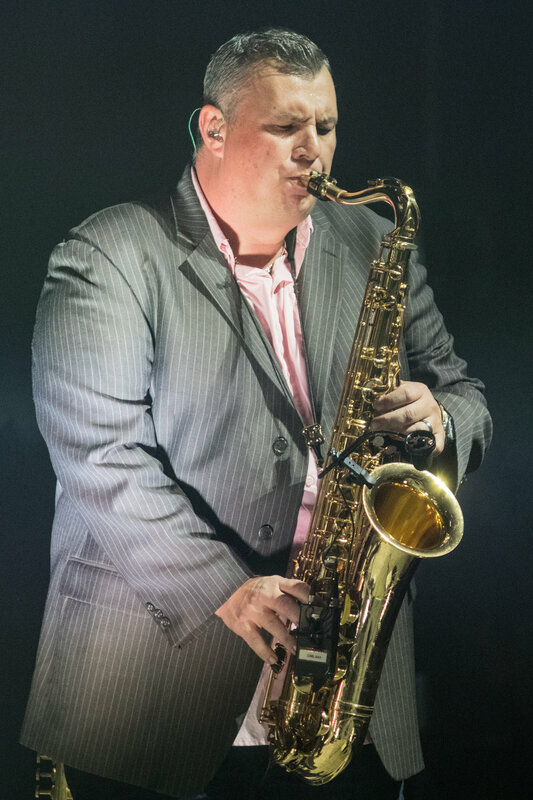 As his band members were chatting with the audience and each other, Joel caught his breath and then played with heart and soul as the audience cheered and sang, Phones lit up again and when he stopped and let the crowd sing acapella, one could have easily thought that this ensemble was rehearsed to perfection. Joel ended the song shaking hands and talking with people in front of the stage. The band left the stage and some house lights came up. Anticipation grew as this audience knew there was more to come. After a few minutes the lights went down and then the stage lights came back on with Joel center stage playing his guitar to “We didn’t start the Fire” from Storm Front in 1989.The crowd was on their feet, making this large arena seem like someone’s oversized living room, as everyone sang and danced basically in unison.